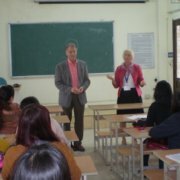 Don has served in 10 different countries with Global Volunteers, and has always chosen to teach conversational English. While doing so at a university in Peru, he talks about his experience and tells us why you should teach conversational English. I choose to teach conversational English because I feel that I can be more productive and supportive by teaching English or other subjects. I like to support in construction (labor projects), but I feel more comfortable doing this. Volunteer teach conversational English to men, women, and children. It is important to enable students in countries with a language different than English to be able to compete in a world that uses English as the neutral language. It gives students more confidence in dealing with people from other countries that speak a foreign language. The people with whom we are in contact are left with have improved their English conversational skills, even if only a little. Also, they get a better feeling and understanding about Americans. Right now I am teaching in Peru and my experience has been very positive. I like the people, the food, and the environment that I have encountered. I particularly enjoyed helping Hans with preliminary design review of his thesis topic, while helping him to translate his abstract into English. This way I was able to apply my own engineering skills as well as my English skills. I have enjoyed immersion in all of the countries in which I have been involved. When I get back home, I like to educate my American fiends on the cultures and people from other countries. So my job does not stop at the end of a Global Volunteers assignment. Don teaching English in China. Just like Don, you can teach conversational English in various countries around the world. All you need is to be able to speak English and a desire to help others.